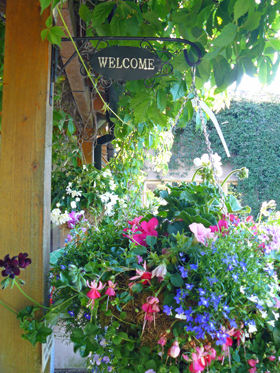 Although initially we grew mainly bedding plants, we now grow and stock a large range of basket and patio plants, many of which are offered as plug plants. In order to help customers make the right choices, we have many of these varieties on display as mature specimens, to give an idea of habit, colour and vigour. We still grow an extensive range of bedding plants, including all the popular lines such as impatiens, begonias and petunias, which we offer in single colour ranges as well as mixed. We also grow some of the more unusual varieties such as cosmos, coleus, cornflowers, cerinthe, rudbeckia and zinnia. For customers wishing to make up their own baskets/containers, we have an extensive range of plug plants and small potted plants of suitable varieties. This includes a range of zonal geraniums, ivy-leaf trailing geraniums, fuchsias and many foliage and flowering plants with a trailing habit. From mid-May we offer for sale a large range of ready filled baskets of various types and sizes including moss-lined, wicker and plastic. These are available in a selection of colour ranges, in mixed and single variety options and all at reasonable prices. We also grow a range of herbs and alpines, which are available in pots of various sizes. We have what is probably the largest range of perennials on offer on the Wirral and we are always happy to give advice if required. For long summer flowering, we stock a large range of half-hardy perennials such as osteospermum, argyranthemum and salvias. Additionally we grow a small range of shrubs but also offer a wider selection of shrubs and conifers which we source from local growers. In response to increasing customer demand for vegetable plants, we have considerably extended the range we now grow. For example, last season we offered 14 varieties of tomato plants. We produce a comprehensive list of the varieties of vegetable plants which are available. 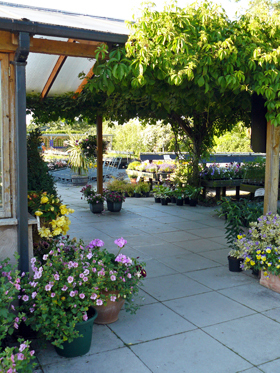 Although we concentrate mostly on stocking plants, we do have a range of terracotta and plastic pots, plus compost, canes, oak barrels, and a small range of other sundries such as fertilisers. If you wish to enquire whether we stock a particular item you need, do please get in touch.